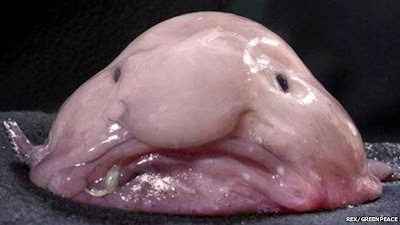 This gives the fish the unofficial title of world's ugliest animal. The society began as a science-themed comedy night and devised its mascot campaign to draw attention to "aesthetically challenged" threatened species. The blobfish tops a list that includes the huge-nosed proboscis monkey, the similarly afflicted pig-nosed turtle, an amphibian affectionately known as a "scrotum frog" and pubic lice.